Cindy is co-owner and the office manager of Orange Home Services. She has an extensive customer service background in various industries with a passion for helping others, integrity, and ethics. Cindy is heavily involved in the community – she serves on the board for the Fox Valley Chamber; on the committee for Cal’s Angels; is the founder of Elburn Women In Business, and part of 100 Women Who Care Fox Valley, Geneva Women’s Club, and Batavia Women’s Club. Cindy is a proud mother and has lived in the Fox Valley area for over 12 years. Jim is the founder and co-owner of Orange Home Services. 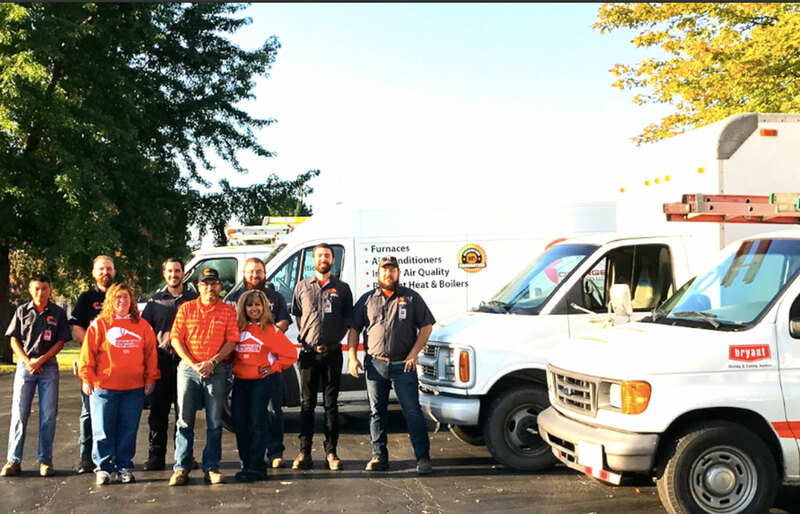 With over 28 years experience in the Heating & Cooling industry, Jim started at the bottom as a helper and worked his way up the ladder along the way to installer to lead installer to field supervisor, for different HVAC companies. In 2010, he had the opportunity to start Orange Home Services and never looked back. He is dedicated to making sure all his customers are 100% satisfied. He treats everyone the way he wants to be treated. He loves growing his team and giving back to the community. He is a founding member of 100 Men Who Give A Damn, member of the Batavia Chamber, Elburn Chamber, and serves on the board for the Fox Valley Chamber and Prairie Path Cycles. Jim is a proud father and has lived in the Fox Valley area for over 12 years. Brent is a people person, adventurer and combat veteran of the US ARMY. From a young age he has enjoyed meeting new people, building relationships and helping those in need. He is a part of the Fox Valley, Batavia and Elburn Chambers of Commerce, President of the Business Alliance Networking Group in Elburn and is a huge supporter of local businesses and charities. His desire to serve, solve problems and ensure others get the most out of life make him a valued asset and a staple figure in our local communities. When Greg was a child he had an incredible and almost unbelievable talent which let him break almost anything he could get his hands on. Naturally, to stay out of trouble he needed to become very skilled in fixing things as well. He became interested in HVAC when a family member who recognized his natural mechanical ability recommended he pursue HVAC as a career. After earning his EPA and NATE/ICE certifications at Joliet Junior College he was hired at Orange Home Servies were he excelled at service and became the Lead Service Technician. When Greg is not working he enjoys painting, fishing, and his truck. Growing up, Ray never really thought about specializing in a trade. After deciding college was not for him and working in retail for five years, he found a job with Orange Home Services. Ray found very soon that Orange was the right place for him. His hard work and dedication helped him to become a great Lead Install Technician. Outside of work Ray likes to spend time with friends and play frisbee golf. Trudi has been living with her husband and two children in the Fox Valley area for the past 25 years. She has worked in Customer Service and Inside Sales and has been with Orange Home Services since 2015. Trudi enjoys working with people and in her free time, she enjoys watching her children play sports. Kurtis started his career in the HVAC industry after returning home from Afghanistan. Starting with no previous experience he has gone through a extensive apprenticeship and continued education. After his apprenticeship he was responsible for training following teams of installers at Orange Home Services, and currently supervises the installation department overseeing the outstanding quality and workmanship that Orange Home Services has come to be known for. After serving 8 years in the US Air Force as a munitions systems specialist, Mike decided to use his GI bill to pursue and education. After attending college for a year he learned that it just wasn’t for him. It was then that his longtime friend Greg recommended a career in HVAC. He gladly decided to take a job opening at Orange Home Services. Mike likes to use his time off to relax and play video games or spend time outdoors. Born in New Britain CT, Peter went to EC Goodwin Technical High school and studied HVAC. He pursued other jobs after high school, but most recently left CT for the chance to work in the trade, here with Orange. Before working in customer service for Orange, Sarah worked for 2 years at a dog daycare and boarding facility as she has a great passion for animals. Unfortunately this was part time and as her life got busier, she found that this job was not enough to support her. When her brother Ray came to her letting her know that his HVAC job needed a little more help in the office, she felt that she would have more opportunity for growth both as a person and in her occupation. When Sarah is not working, she enjoys tinkering with computers and cars, video gaming, kayaking, and generally being out in nature. More members to be listed soon!